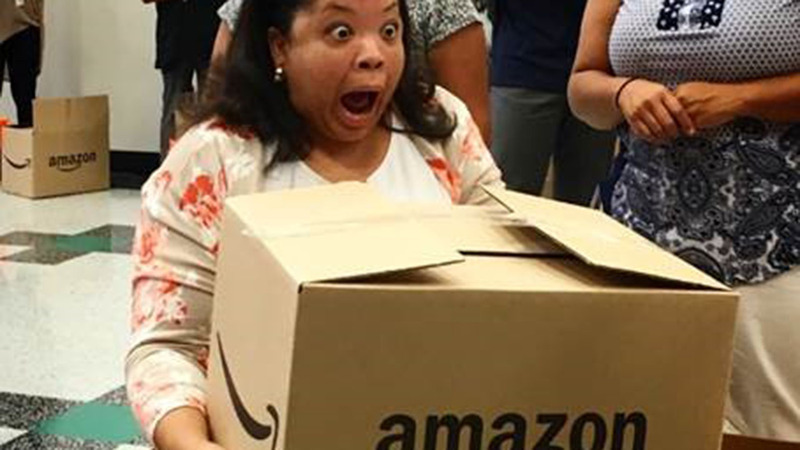 Surprised teacher receives box of school supplies from Amazon. HOUSTON (KTRK) -- The new school year is around the corner and students aren't the only ones buying school supplies. Yesterday, teachers at Paige Elementary were greeted with an unexpected delivery. Amazon surprised teachers of Roderick Paige Elementary School in Houston with $10,000 worth of new school supplies. The supplies will support them and their students as the new school year begins. Paige Elementary was 1 of 10 schools across the country selected by Amazon to receive this donation. Inside the special delivery of Amazon Smile packages were much needed items like color printers, portable dry erase boards and paper. The teachers expressed tears of joy and gratitude toward Amazon General Manager Scott Sharp. Many elected officials were present including Dr. Grenita Lathan, Chief School Officer for HISD North Area Schools; Karla Cisneros, City Council Member of District H and the school's namesake, Dr. Rod Paige, former U.S. Secretary of Education (2001-2005) and superintendent of HISD. Teachers across the United States spend between $400-$1,500 out of their own pockets on school supplies each year for their students and classrooms. The donation was made as an effort to lessen the financial load for teachers in order to start the year with the proper supplies to help their students create, invent, and imagine to their fullest potential.